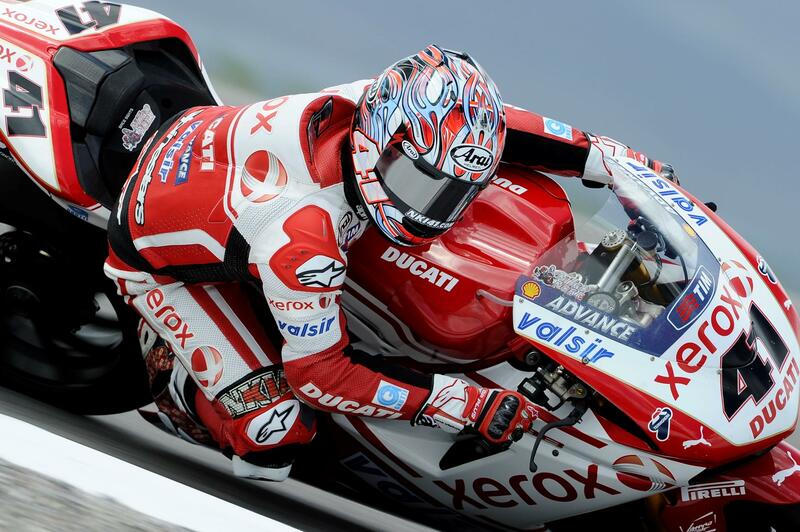 Xerox Ducati rider Noriyuki Haga was the surprise fastest man at the end of the first qualifying session at Brno. Haga is not known for his pace in qualifying and during the 2010 season has often struggled to set fast one off lap times, which have compromised his grid position and race results. But despite scorching 58 degree track temperatures the Japanese rider was in impressive form to finish the day 0.294 seconds faster than second place man Cal Crutchlow. Crutchlow used a new set of tyres to jump up the leader board with his final lap of the day to finish ahead of Haga’s team-mate Michel Fabrizio in third. Carlos Checa picked himself up from a crash when he lost the front of his Althea Ducati to set the fourth fastest time of the day. Max Biaggi made his traditional slow start to the weekend, but began to up his pace in the final ten minutes of the session where he posted four fast laps onboard his factory Alitalia Aprilia. Spaniard Ruben Xaus backed up his positive testing results at Imola last week to go sixth quickest ahead local hero Jacob Smrz who made his first appearance on the Aprilia RSV4 after switching from Ducati. Jonathan Rea benefited from a new spec front tyre which helped his performance and reduced chatter to end the day in eighth. Rea piped Sterilgarda Yamaha rider James Toseland who looks to be in much better form following his tough weekend in Misano and in testing at Imola. Shane Byrne held sixth in Free practice but dropped to 13th with Leon Camier doing a good job of learning the track in 16th. Leon Haslam endured a torrid day after suffering with the same engine braking problems that plagued him at Misano finishing 17th. Haslam persevered with one bike and will need to find a solution quickly if he wants to get his weekend back on track. Troy Corser saw his hopes of repeating his Misano podium take a massive blow after he crashed his BMW S1000RR in the final minute of the session. Although nobody saw the crash he is believed to have high sided exiting turn eight. The 38 year old suffered concussion and was complaining of chest pains and was airlifted to Brno hospital for further x-rays and a CT scan. He is expected to stay in hospital overnight for observation.